which I wrote in the context of Windows 8.1. You always have to be careful (or maybe completely paranoid) when you share data across threads – generally, I’d steer well clear of it whenever I could. 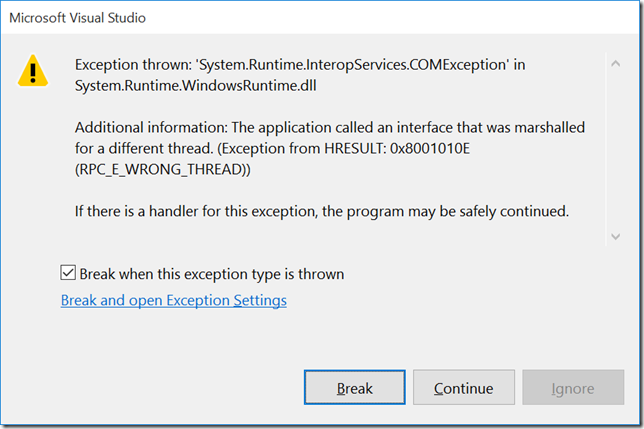 Those dispatcher threads for those windows are ‘Application Single Threaded Apartment’ (ASTA) threads which have automatic protection built-in to avoid re-entrancy and you can easily tie yourself up in knots with this (as I have). Someone came back to me and asked for more detail on this and so I thought I’d experiment and write up some sketchy notes here based on a simple example. and that SubWindowUserControl is just a blank user control displaying a grid with a red background. 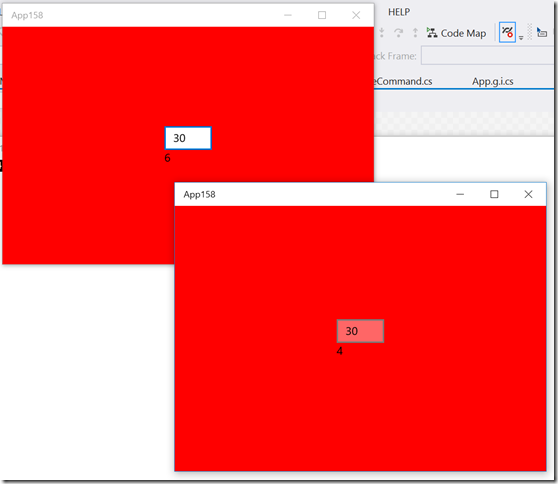 and, clearly, the count displayed in one window is different from the count displayed in the second window and if I use the debugger I can see three instances of my SimpleViewModel being created here – once at application startup and once when each window is created. 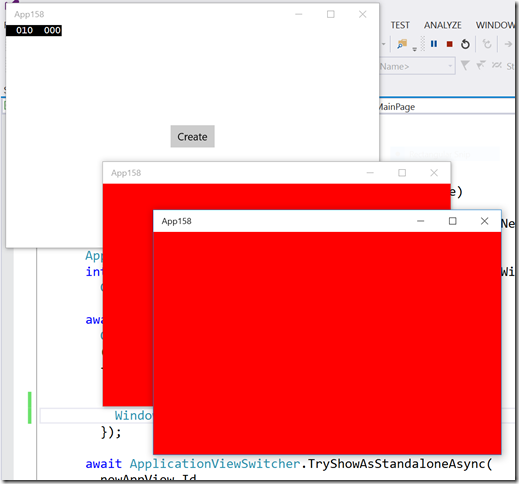 Being honest, I didn’t know that this would happen and so I definitely learned something here – my app.xaml resources are being instantiated on a per window basis and that was news to me. 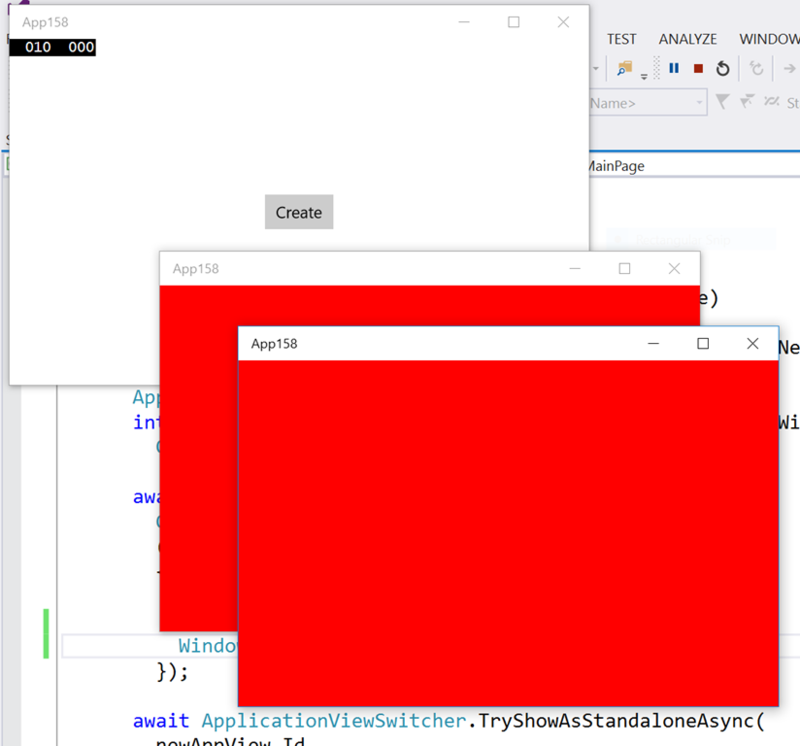 and now, while I still see multiple SimpleViewModel instances being created as I run my app and create 2 secondary windows, it’s clear (I think) that the secondary windows are sharing the same object instance as their DataContext. which makes sense because I clicked on the ‘increment’ button in the window that was showing a managed thread id of 6. What’s going on here? Somehow an event handler has been added to an event and now that event handler can’t be called? 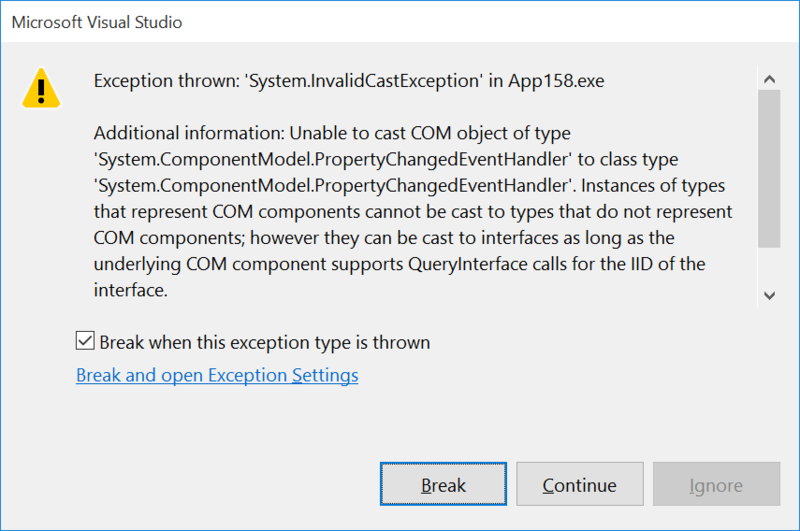 I suspect it’s more that the event handler that’s been added has been marshalled from a particular context and that context is making a conscious choice to avoid being invoked here. and that was no big surprise. The question then really becomes one of which thread should be firing these property changed notifications and the answer is going to presumably be ‘the right thread for each window. To achieve that means somehow keeping a mapping table between event handlers and Dispatchers and then trying to use that table to do some kind of look up to figure out which dispatcher should be used to invoke which event handler. That’s not really where I want to end up. // Capture the sync context that we are created with. and I think it works in the sense that when I click the button, the dispatcher thread for the window that picks up the event and executes the command code is ultimately the thread that increments the integer and fires the change notification handlers in the method SharedDataValue.OnValueChanged. But, the handler for that event in SimpleViewModel.OnValueChanged uses the synchronization context (i.e. 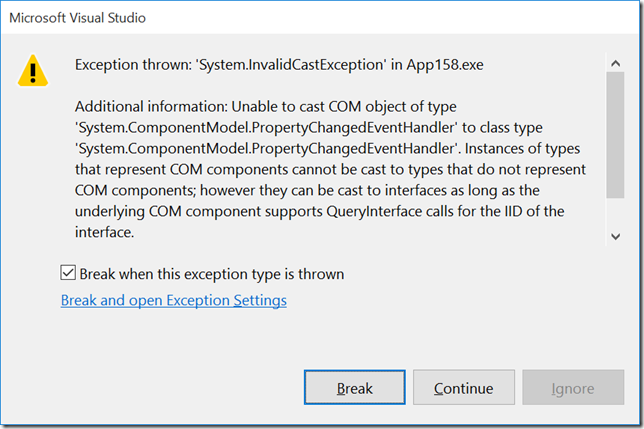 dispatcher thread) that it captured at construction time from the owning Window to actually fire the INotifyPropertyChanged.PropertyChanged event back into the XAML binding code and so that ends up happening on the ‘right’ thread. Without the use of the synchronization context, this code blows up in the same way as the first example and, in many ways, I’ve ended up with an implicit lookup table in the sense that each SimpleViewModel instance has a reference to the ‘right’ synchronization context in which to do work on behalf of the consuming View. then that seems to work as expected. 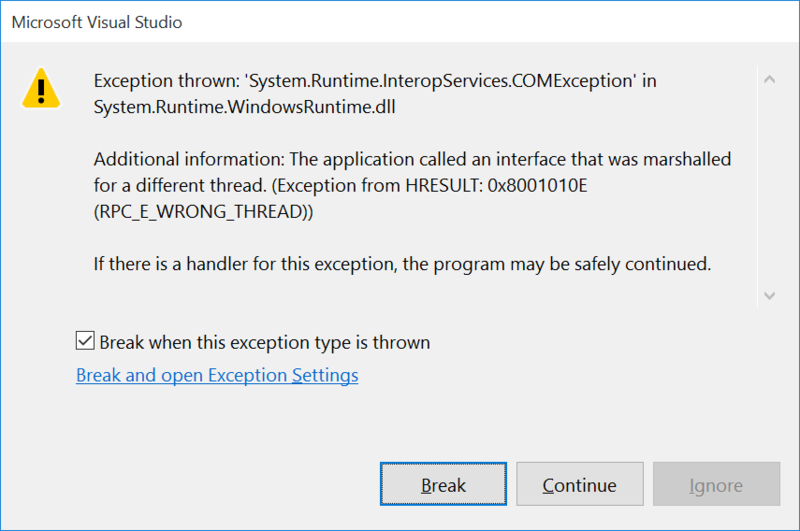 In summary – trying to share a view model across windows here is going to cause me a problem because it means that the thread associated with one Window starts trying to talk directly to UI constructs owned by another Window. Ultimately, I made each window have a separate ViewModel but I also made that ViewModel aware of the synchronization context that it was created with such that it can use it to dispatch work at a later stage. With that in place, both of those view models can pull data from some central, shared “service” (represented by a simple integer value here) which provides data change notifications.